By Lance C. Dalleck, Ph.D.
You know that adequate recovery between workouts is absolutely essential to your clients’ performance and continued improvement. But exactly how do you determine the optimal amount of recovery time for each client? Learn the science behind recovery and how to practically apply these principles to create safe and effective training programs for your clients. Recovery from exercise training is a vital component of the overall exercise program, and paramount for performance and continued improvement. If the rate of recovery is appropriate, higher training volumes and intensities are possible without the detrimental effects of overtraining. Therefore, an understanding of the physiological concept of recovery is essential for designing optimal training programs. Considerable individual variability exists within the recovery process due to training status (trained vs. untrained), factors of fatigue and a person's ability to deal with physical, emotional and psychological stressors. The following article offers evidence-based research and practical applications on recovery to help you create safe and effective training programs for your clients. Skeletal muscle performance, be it sprinting down the field during a soccer match or cycling 40 kilometers in the middle stage of a triathlon, requires a constant supply of energy. Adenosine triphosphate (ATP) provides the immediate source of energy for skeletal muscle contraction for these types of exercise scenarios, and is frequently referred to as the energy currency of the cell or the universal energy donor. Given that ATP is essential for repeated muscle contraction, it might seem logical that large stores of ATP exist within skeletal muscle. This is not, however, the case. In fact, if ATP could not be rapidly regenerated, the resting stores of ATP would quickly be depleted during high-intensity exercise. There are three main energy pathways available to regenerate ATP—the phosphagen system, glycolysis and mitochondrial respiration. These pathways differ considerably in the maximal rate of ATP regeneration, and the duration for which this maximal rate can be sustained. Peak performance of the different energy systems can be compromised following challenging exercise conditions, such as repeated high-intensity sprints or extended submaximal running. Optimal recovery entails restoring the capacity for each energy system to function once again at maximal levels. Understanding how the three energy pathways function provides the foundation for designing an exercise program that optimizes recovery. The sidebar at the end of this article offers a brief primer on these three energy pathways. Decreased substrates: Exercise conditions that extensively tax either the phosphagen system or glycolysis will ultimately lead to depletion in the primary substrate (or fuel) for each energy pathway. The skeletal muscle concentration of phosphocreatine (CrP) is limited, and after approximately 10 seconds of high-intensity exercise, the resting CrP stores are rapidly depleted (Baker, McCormick and Robergs, 2010). Activities that rely heavily on the phosphagen system for ATP provision include things like sprinting, chopping wood and jumping rope. High-intensity exercise, whether performed during a training session or a competition, is frequently repeated over multiple bouts. Therefore, recovery from CrP degradation becomes critical in these instances if high-intensity exercise performance is to continue. Likewise, the primary substrate for glycolysis—glycogen—can be depleted following prolonged and vigorous endurance exercise. Unless glycogen stores are sufficiently restored prior to the next exercise session, a high level of performance will be compromised (Powers and Howley, 2009). An accumulation of metabolic by-products: ATP turnover rates are elevated during high-intensity exercise. Concomitantly, increased glycolytic flux and ATP hydrolysis contributes to an accumulation of lactate and protons within the cells. Both of these molecules can impair continued ATP resynthesis and skeletal muscle contraction through different mechanisms (Thomas et al., 2012). Lactate has been found to hinder the electrical stimulus for muscle contraction. The accumulation of protons leads to a decreased muscle pH, and cellular acidosis impairs the recovery of CrP stores. Furthermore, the key enzymes involved in glycolysis, including phosphorylase and phosphofructokinase, are each down-regulated by an accumulation of protons. Recovery from cellular acidosis is paramount for restoring the capacity to regenerate ATP from both the phosphagen system and glycolysis (Bishop, Girard and Mendez-Villanueva, 2011). Skeletal muscle damage: High-intensity aerobic and resistance exercise can impose considerable damage to skeletal muscle, including the sarcolemma, contractile proteins, and connective tissue (Powers and Howley, 2009). These disturbances result in a diminished capacity to generate peak muscle forces that persists until repair is complete. The muscle damage impairs the ability to transport blood glucose into the skeletal muscle cell, which, in turn, leads to a decreased capacity to replenish glycogen stores (Ivy, 2004). Skeletal muscle damage also leads to soreness and pain. It is well known that high levels of maximal oxygen uptake (or VO2max) are linked with superior performance in endurance-related events. However, VO2max also plays an integral role in recovery. Research has shown that individuals with a greater VO2max recover more quickly between repeated sprints, and consequently have a superior performance in the later bouts of a series of sprints (Bishop and Edge, 2006). Individuals with high VO2max levels are also able to more rapidly resynthesize CrP stores. Recent research has shown that high-intensity interval training (six to 12 interval bouts of two minutes each at a workload of 100% VO2max with one-minute rest) augmented VO2max levels and the capacity for phosphocreatine resynthesis (Bishop, Girard and Mendez-Villanueva, 2011). As mentioned earlier, an accumulation of proton molecules within the cell can impair skeletal muscle function. The cellular environment possesses a buffering capacity system to help combat increased acidosis (i.e., proton accumulation); however, in untrained individuals this system is easily overwhelmed during high-intensity exercise. Correct exercise training confers an increased muscle buffering capacity, which will ultimately contribute to a more rapid recovery. Interestingly, research has reported that it is high cellular concentrations of protons that provide the necessary stimuli for improvements in muscle-buffering capacity (Bishop, Girard and Mendez-Villanueva, 2011). It appears that high-intensity interval training (six to 12 interval bouts of two minutes each at a workload of 90–100% VO2max with one-minute rest) is a successful strategy for eliciting favorable buffering capacity adaptations. The intensity of the interval sessions is absolutely essential to eliciting an increased buffering capacity. Research has reported that both lower intensities (workloads of 50–70% VO2max) and higher intensities (workloads >100% VO2max) have detrimental effects on muscle buffering capacity adaptations. Given that increased concentrations of lactate and proton molecules within the muscle cell are detrimental to skeletal muscle performance, it is not surprising that the cell has a means for removing these fatigue-inducing products of metabolism from the cell. Monocarboxylate transporters (MCT) are proteins found on the cell membranes that facilitate the efflux of lactate and proton molecules from the intracellular environment into the blood. MCT is, in fact, a co-transporter in that it collectively transports a molecule each of lactate and proton out of the cell. Exercise training leads to increased MCT concentration and, therefore, a concomitant greater capacity for removal of excessive lactate and protons from the cell (Bishop et al., 2008). This adaptation clearly provides a means for quicker recovery from exercise conditions that increase muscle lactate and proton concentrations. A suitable training program for improving MCT concentrations appears to be shorter interval bouts with longer 1:3–4 work-to-rest ratios [four to eight interval bouts of 30 seconds each at a workload of ~130% VO2max (equivalent to 150–200m near all-out sprint) with 180–240 seconds recovery] (Thomas et al., 2012). In addition to the previously mentioned physiological adaptations, training recovery can be optimized by correctly managing the various components surrounding the exercise program: frequency, intensity, time and type (FIIT; see Figure 1) (American College of Sports Medicine, 2010). Frequency refers to the number of days per week devoted to recovery. If a client is simply recovering from a somewhat hard training session, the frequency of recovery may be a single day. Conversely, a client recovering from a 10-kilometer run may require several days of recovery. It should also be noted that the frequency of recovery could also extend beyond a single week. 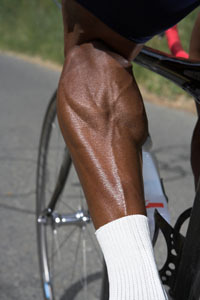 In fact, it is not uncommon for professional athletes to spend several weeks in recovery microcycles following a competitive season. It is important to establish intensity levels for your clients’ active recovery bouts, both during and between exercise sessions. For example, if your client performs an interval session that consists of four repetitions of four minutes at 90–95% maximal heart rate interspersed with two minutes of active recovery bouts, you should recommend that they perform active recovery bouts at a specific intensity (e.g., 40–60% maximal heart rate). The intensity of recovery may also extend to the overall intensity of a daily session of exercise dedicated to recovery. For example, a recovery day might include moderate-intensity, 60-minute bicycle ride at 65–75% of maximal heart rate. Time of recovery may refer to either the recovery time between interval bouts (e.g., two-minute rests between four-minute intervals) or the duration of an entire recovery session (e.g., a 60-minute bicycle ride). When determining the time of recovery for a whole training session, it is critical to establish an appropriate amount of time to allow for recovery to occur before the next session is scheduled. The type of recovery may refer to either active or passive recovery. Active recovery comprises continued exercise at a substantially lower intensity or workload, while passive recovery consists of resting completely. 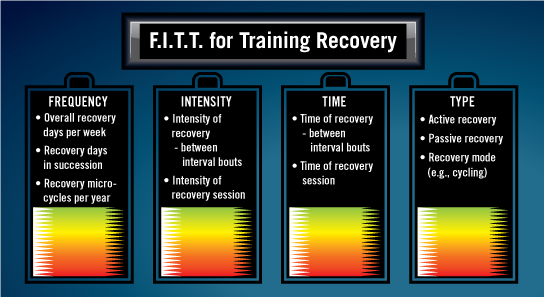 The type of recovery to be performed is a consideration for both the time between interval bouts, as well as between training sessions. In terms of an active recovery, the mode of exercise to be completed is an additional variable to be determined. For example, it is common for clients who normally run to cross train; therefore, an active recovery day may consist of swimming or exercising on an elliptical cross trainer. The following practical, research-based recommendations will help you design and implement training programs that help maximize recovery and, therefore, performance. Whether it is between interval bouts, immediately after an interval session, or the day following strenuous exercise, there is compelling research evidence that active recovery is superior to passive recovery (Del Coso et al., 2010). From a physiological perspective, this practice makes sense. Continued blood flow to the skeletal muscle bed promotes the resynthesis of CrP and glycogen stores, and also facilitates the removal of protons. Collectively, these factors aid in recovery. The intensity of intervals should be high (~90–95% maximal heart rate), but not maximal. The duration of interval bouts should equate to two minutes with a shorter recovery period (e.g., one minute). The number of interval bouts can range from three to 12 per session. The number of high-intensity interval training sessions per week should be between one and three, with at least 48 hours between sessions. Regrettably, it is common for many clients and athletes to exercise too hard during periods of recovery, be it between interval bouts, following an interval workout or the day after competition. You can help your clients avoid or minimize this error by establishing specific target intensities for recovery scenarios. Research has reported that active recovery bouts of very light intensity (< 50% maximal heart rate) are optimal for decreasing lactate and proton levels (Del Coso et al., 2010). In terms of coupling the very light recovery intensity with a proper cool down, research suggests that approximately 10 minutes is an ideal duration. In terms of establishing an appropriate exercise intensity for recovery sessions, previous studies indicate that moderate-intensity (65–75% maximal heart rate) exercise is sufficient (Powers and Howley, 2009). Despite the research-based recommendations put forth in this article, recovery remains an under-researched topic and is, therefore, not as well understood as other areas of training (Bishop et al., 2008). Moreover, evidence suggests that there is considerable variability among individuals in how much time is required for training recovery to occur (Bishop, Jones and Woods, 2008). Together, these factors point to the critical role you play in identifying the most appropriate training recovery strategies for each of your clients. While this article presents some essential guidelines, it is up to you to pinpoint the recovery FITT that best suits each client, which will require at least some measure of trial and error. The most rapid means for regenerating ATP is the phosphagen system. This pathway involves a single reaction, whereby the enzyme creatine kinase is responsible for catalyzing the metabolite creatine phosphate (CrP). Subsequently, free energy is made available to rephosphorylate ATP (i.e., add a P to ADP). The enzyme creatine kinase, which facilitates the CrP reaction, is up-regulated by an increased concentration of ADP. Creatine kinase activity is inhibited when concentrations of ATP are normal. Therefore, when ATP demand increases suddenly, as is the case with the onset of high-intensity exercise, the hydrolysis of ATP results in elevated levels of ADP, and thus the necessary biochemical signal for this pathway to regenerate ATP. This design permits an almost instantaneous capacity to match ATP demand with a swift supply. The glycolytic metabolic pathway provides ATP at a rate below that of the phosphagen system, but still nearly twice as fast as mitochondrial respiration. Glycolysis comprises a series of nine enzymatically catalyzed reactions. Glycolysis involves the conversion of one molecule of blood glucose or muscle glycogen to two molecules of pyruvate or lactate. The activity of the enzymes phosphorylase and phosphofructokinase are both swiftly up-regulated at the onset of intense exercise. There are two phases to glycolysis. Phase one is an energy-investment phase, while phase two represents the energy-generation phase. Phase one of glycolysis consists of four reactions and requires an investment of either 1 or 2 ATP molecules to proceed. The phosphofructokinase reaction requires an ATP. This reaction is considered the main rate-limiting reaction of glycolysis. If glucose is the substrate provided for glycolysis, an additional ATP is required for glucose transport from the blood into the muscle cell (this is facilitated by the transporter protein GLUT-4). The second phase of glycolysis involves five additional reactions from which 4 ATP molecules and 2 pyruvate molecules are produced. The phosphoglycerate kinase and pyruvate kinase reactions each produce 2 ATP. It is also important to note that two molecules of NAD+ are reduced to NADH during phase two of glycolysis from the glyceraldehyde-3-phosphate dehydrogenase reaction. In summary, the reactions of the glycolytic energy system produce 2 pyruvate, 2 NADH, and either 2 or 3 ATP. The difference in net gain of ATP can be explained by the 1 ATP cost of bringing glucose into the muscle cell via GLUT-4 transporter protein as the substrate for glycolysis. The third pathway by which ATP is regenerated is through mitochondrial respiration. In terms of overall quantity, the regeneration of ATP molecules is greatest from fuels that undergo mitochondrial respiration. However, the maximal rate of ATP regeneration from mitochondrial respiration is considerably less than either the phosphagen system or glycolysis. Pyruvate produced from glycolysis can enter into the mitochondria where it undergoes further oxidation in the Krebs cycle. The pyruvate dehydrogenase reaction facilitates the entry of pyruvate into the mitochondria. During this reaction, NADH Acetyl-CoA molecules are formed. 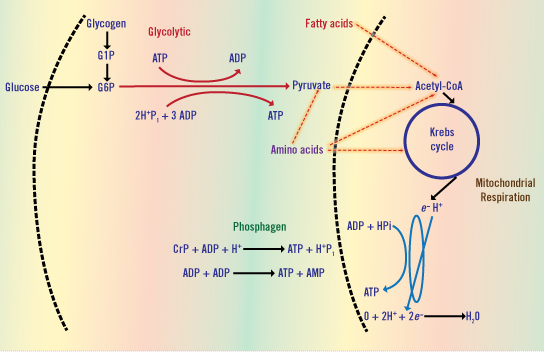 Acetyl-CoA molecules subsequently pass through a full turn of the Krebs cycle, yielding molecules of ATP, FADH, and NADH. The NADH and FADH molecules produced from the Krebs cycle then move onto the electron transport chain where additional ATP is regenerated. Depending on whether or not glucose or glycogen is the initial molecule entering into glycolysis, the overall tally of ATP regenerated from mitochondrial respiration summates to 32 or 33 ATP. American College of Sports Medicine (2010). ACSM’s Guidelines for Exercise Testing and Prescription (8th ed.). Baltimore, Md. : Wolters Kluwer/Lippincott Williams & Wilkins. Baker, J.S., McCormick, M.C. and Robergs, R.A. (2010). Interaction among skeletal muscle metabolic energy systems during intense exercise. Journal of Nutrition and Metabolism, doi:10.1155/2010/905612. Bishop, D. and Edge, J. (2006). Determinants of repeated-sprint ability in females matched for single-sprint performance. European Journal of Applied Physiology, 97, 373–379. Bishop, D., Girard, O., Mendez-Villanueva, A. (2011). Repeated-sprint ability–part II: Recommendations for training. Sports Medicine, 41, 741–756. Bishop, P.A., Jones, E. and Woods, A.K. (2008). Recovery from training: A brief review. Journal of Strength Conditioning Research, 22, 1015–1024. Bishop, D. et al. (2008). Effects of high-intensity training on muscle lactate transporters and postexercise recovery of muscle lactate hydrogen ions in women. American Journal of Physiological Regulatory Integration and Comparative Physiology, 295, R1991–R1998. Ivy, J.L. (2004). Regulation of muscle glycogen repletion, muscle protein synthesis and repair following exercise. Journal of Sports Science Medicine, 3, 131–138. Powers, S.K. and Howley, E.T. (2009). Exercise Physiology: Theory and Application to Fitness and Performance (7th ed.). New York, N.Y.: McGraw-Hill Companies. Thomas, C. et al. (2012). Effects of acute and chronic exercise on sarcolemmal MCT1 and MCT4 contents in human skeletal muscles: Current status. American Journal of Physiological Regulatory Integration and Comparative Physiology, 302, R1–R14. Lance C. Dalleck, Ph.D., is academic coordinator of the cardiac rehabilitation postgraduate program at the University of Auckland in New Zealand. His research interests include improving exercise performance and health outcomes through evidence-based practice, quantifying the energy expenditure of outdoor and non-traditional types of physical activity, and studying historical perspectives in health, fitness and exercise physiology.